The Department of English and the Centre for Life-Writing Research at King’s College London have won an AHRC Collaborative Doctoral Award with the British Library, for the project: ‘Ways of Seeing John Berger: Researching the British Library’s John Berger Archive’. Applications are sought for doctoral award to study John Berger archive – to be supervised by Professor Max Saunders, Professor of English and Co-Director of the Centre, and Jamie Andrews, Head of Modern Literary Manuscripts at the British Library. 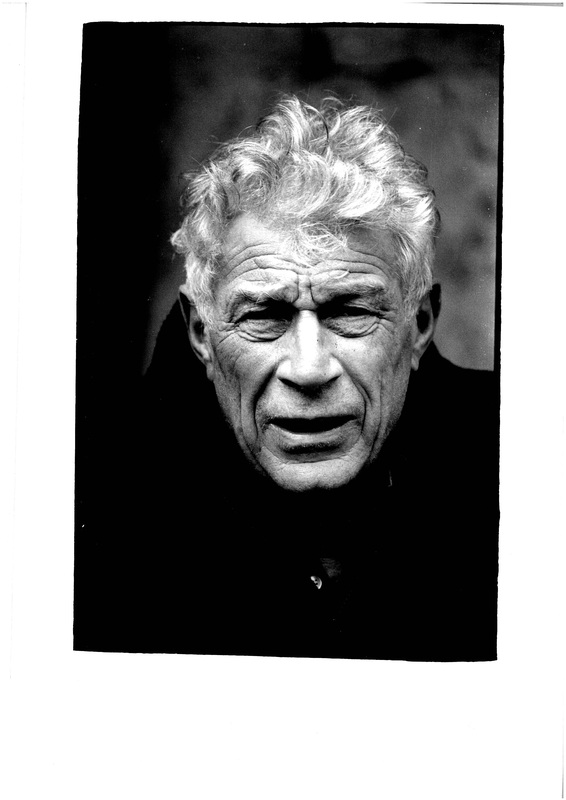 The writer and critic John Berger’s donation to the British Library of a substantial collection of papers in 2009 was widely reported in the national and international media. The archive covers all aspects of Berger’s uniquely varied career as novelist, cultural collaborator, and influential art critic. Berger’s work has had an enormous impact across a range of disciplines and activities. He has been a major creative presence in the literary world, for his fiction, drama, and cultural journalism. He transformed Anglo-Saxon art history, and revolutionised the presentation of cultural material in the media. A major reassessment of his work across some or all of these fields would in itself be an event of cultural significance. It is envisaged, however, that this project would prompt a more sustained consideration of the political and social role of the cultural industries and the heritage sector in the light of Berger’s provocative work in this area. The Berger archive contains over 100 file boxes of drafts, scripts, reviews, and correspondence. 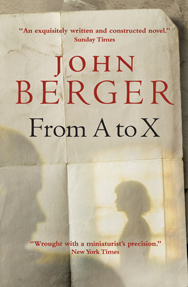 It includes drafts of some of Berger’s best-known fiction, including the 1972 Booker Prize-winning novel G, the trilogy Into their Labours, and the recent Booker-nominated novel From A to X. A series of leather-bound notebooks contain drafts and notes for Berger’s controversial first novel, A Painter of Our Time (1958). The archive also covers his work in other media; especially documents relating to his landmark book and television series Ways of Seeing, and his work with theatre companies such as Complicité and New York’s The Talking Band, as well as letters and scripts relating to Berger’s collaborations with the Swiss film director Alain Tanner. John Berger’s early novels A Painter of Our Time and Corker’s Freedom will be published in beautiful new editions this summer. A Seventh Man – his seminal exploration of migrant workers, illuminated by the celebrated photographer Jean Mohr – will follow as an updated edition with new material in the autumn. Said to be John’s favourite out of all his books, A Seventh Man asks Why does the Western economy depend on the importing of migrants to do its most menial work? Why are the owners of those arms and hands treated like replaceable parts of a machine? What compels the migrant worker to leave their own country and accept this humiliation? John Berger and Jean Mohr set out to consider the migrant worker’s life – their material circumstances and inner feelings – and in doing so, revealed how the migrant is not on the margins of modern experience, but is absolutely central to it. First published in 1975, this finely wrought exploration of the migrant’s world, and Western preconceptions of it, remains as urgent as ever. The critically acclaimed novel From A to X: A Story in Letters and Hold Everything Dear: Dispatches on Survival and Resistance are available now. John Berger has also written the introduction to one of the twentieth century’s most influential books on art, Ernst Fischer’s The Necessity of Art. Darwish’s masterpiece Mural, and Exile are reviewed by Eric Ormsby, for Bookforum. [Mural] is an exquisitely designed book, enhanced by several of Berger’s evocative drawings and marred only by Berger’s strident, grandstanding introduction. … For Mural is a spiralling and circuitous poem, alive with swerves and sly twists, moving along corridors that dead-end only to open out unexpectedly into detours and hidden passageways. That single adjective, conspicuous in Darwish’s spare style, presages the very structure of Mural. … Darwish was m aster of a clear, pure Arabic diction, subtly inflected, and though his lines appear jagged on the page, they are driven by classical (rather than colloquial) cadences; paradoxically enough, this makes his enigmatic passages—and there are many in Mural even more recondite. … Darwish combines lyrics, prose poems, and aphorisms, in rather disjointed fashion. The full article is available at the Bookforum website by a free registration here. Mahmoud Darwish (1942–2008) published some thirty books of poetry and prose; his work has been translated into thirty-five languages. His many international awards include the Lenin Peace Prize and the Lannan Foundation Prize for Cultural Freedom. John Berger’s latest novel is From A to X.
Rema Hammami is professor at the Institute for Women’s Studies at Birzeit University, Ramallah. Why did you decide to be a writer, not a painter? It was a very conscious decision to stop painting – not stopping drawing – and write. A painter is like a violinist: you have to play every single day, you can’t do it sporadically. For me, there were too many political urgencies to spend my life painting. Most urgent was the threat of nuclear war – the risk of course came from Washington, not Moscow. And now, living in a village is very social, much more than the city. And the practical tasks – shovelling snow, the political tasks which come on email – I do these first before I sit down to write. It is striking how many of your books have been done as collaborations – most recently a translation with Rema Hammami, of Mahmoud Darwish’s epic poem “Mural”. Yes, I really welcome collaboration. I’ve also done collaborations with my son Yves, my daughter, Katya, and in the years of television film in the 1960s, with Mike Dibb. The important thing about collaboration is not to make compromises. All differences of opinion have to be faced, reflected on. It’s like the opposite of committees, where people are swamped by compromises. Mike Dibb remains a close friend. In the 1960s, working for television was a way of earning money – books didn’t pay, I had to survive. So I did interviews, reportage. I was at ease with TV. We had this idea of making a four-programme series about the relationship between art and image. It was very low-budget, not important to anyone, so no one was on our backs. We spent six or eight months working on it. The BBC didn’t believe in it and showed it very late at night. The book came as a hurried add-on. What was it like working with Rema Hammami? Rema and I travelled together in Palestine, and worked on this translation together, and by email, for years. We argued incessantly. Translation is such a subtle process: you have to penetrate the language, get behind it. You have to find the rhythm, the silences. Rema was the brave one who took our work to Darwish to ask what he thought. He approved. What we had was a voice – Darwish’s in English, which has its own rhythm, cadence, forms of silence. John Berger was awarded the 2009 Golden PEN Award for a Lifetime’s Distinguished Service to Literature, an award presented to the very greatest of writers – those whose work has given both pleasure to readers and inspiration to their fellow writers. He is the author of From A to X and Hold Everything Dear: Dispatches on Survival and Resistance. He illustrated Darwish’s Mural and translated it with Rema Hammami, professor at the Institute for Women’s Studies at Birzeit University, Ramallah. 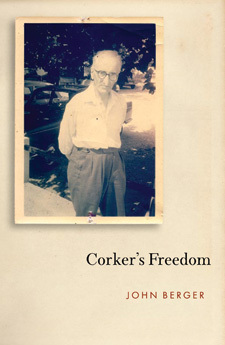 Forthcoming this summer are his early novels Corker’s Freedom and A Painter of Our Time. Listen to John Berger talking about the poet ‘Mahmoud Darwish: Spirituality in the Modern World’ here. 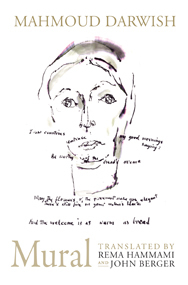 John Berger translated and illustrated Mahmoud Darwish’s epic poem Mural. See here for more information and past winners. We do not protest the individual Israeli filmmakers included in City to City, nor do we in any way suggest that Israeli films should be unwelcome at TIFF. However, especially in the wake of this year’s brutal assault on Gaza, we object to the use of such an important international festival in staging a propaganda campaign on behalf of what South African Archbishop Desmond Tutu, former U.S. President Jimmy Carter, and UN General Assembly President Miguel d’Escoto Brockmann have all characterized as an apartheid regime. John Berger’s most tangible influences were that tiny band of intellectuals who combined fine-art criticism with a social conscience: John Ruskin; Oscar Wilde; Walter Benjamin. Great writers all, and 82-year-old Berger is their equal. Indeed, that was true as early as 1972, when he published Ways of Seeing, the classic work of art criticism that became a founding text of cultural studies and still has a huge influence on art teachers and their students. 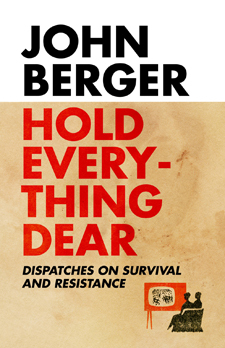 What is most gratifying about the report we publish today is that Berger still holds to the humane, generous values set down in that book, rather than make that long, cliched voyage to being a reactionary with a dessicated heart. The archive of one of the greatest thinkers in postwar Britain – a Booker-winning novelist, an artist, a critic – would have fetched a usefully-high price from any number of American universities, but Berger has given it for free to the British Library. All he wants is for the BL’s representative to help him with some farmwork. That is a typically bit of puckishness from a man who, when he claimed the Booker for his novel G, delivered a tirade of an acceptance speech against the event’s corporate sponsors and promptly handed over half his prize money to the Black Panthers. Gestures like that distracted (how could they not?) attention from his aphorisms such as “Nobody had ever sworn in paint before Picasso”. A sharp, bold statement – but it is also generous, helping the reader see the work under discussion. Those same qualities are true of its author. 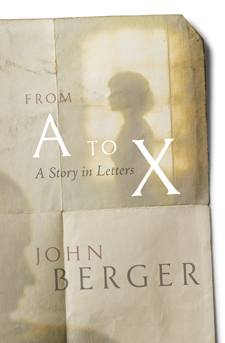 John Berger is the author of the Booker longlisted From A to X: A Story in Letters out now in paperback. Click here to read more about the book from the Verso website.